Offering you a complete choice of products which include pu dome stickers, polyester stickers, pvc stickers, bronze stickers, pre sensitized stickers and copper stickers. We are pioneers in the manufacturing and exporting a wide collection of PU Dome Stickers by utilizing quality materials such as using thick and crystal clear polyurethane materials. The offered stickers are crafted by professionals who have immense domain expertise and well understand the needs of clients. 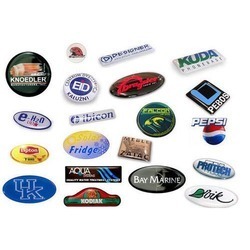 We are one of the leading manufacturers, suppliers and exporters of a wide range of Polyester Stickers. 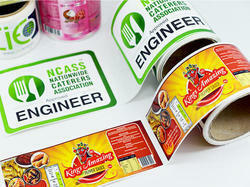 These stickers are used for labeling different products in various industries. Furthermore, these stickers are appreciated among our valuable customers for their durability, in house punching facility and cost effectiveness. These high quality products are available at cost effective market prices. Our clients can avail from us an extensive range of PVC Stickers that are available in varied designs and color combinations. These products are manufactured using latest technology and sophisticated plant machinery, to ensure high standards of quality. Moreover, our products are known for their features like trendy design, good adherence and waterproof nature. These products can be customized as per the requirements of our valuable customers. 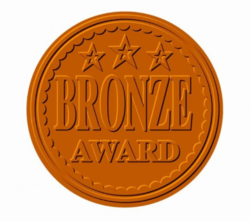 We are the largest manufacturers and exporters of Bronze Stickers across the globe. The material due to its shining yellow classy appearance still widely used in many industries. The process of making labels in brass involves Chemical etching of the material and then providing required finishes such as Mirror Buffed, Matt, Brush finish etc. 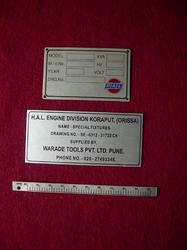 The Etched images are filled with durable Automotive or Epoxy Paints for the everlasting effect. Again the durability and withstand level to the harshest condition is the key of our product. We invariably coat the material with clear lacquer for everlasting shining. 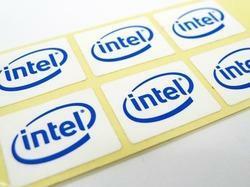 We offer best quality Pre Sensitized Stickers at reasonable prices. We design and develop these stickers from best quality raw materials, latest technology and advanced machinery. These stickers are highly appreciated for their smooth finish and durability. 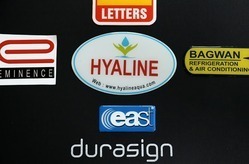 Our stickers are strictly resistant to chemicals, heat and corrosion. They also offer easy fixation. Our bond with our customers is an achievement for us. 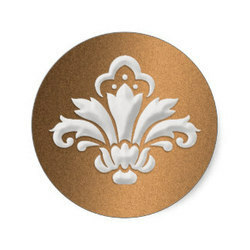 We are one of the leading manufacturers of Copper Stickers. These stickers are manufactured from quality tested raw materials and advanced machinery. The product is reasonable and manufactured according to industry set quality parameters. They are appreciated for their durability and hassle free service life. They find their application in industrial buildings, educational institutes, shops and shopping malls. We offer them at reasonable prices. The changing and revolutionary technology of Doming Stickers is another fine product in our armoury. The labels are produced with the unique screen/etched or print process any substrate metal or non metal top surface is treated with flexible epoxy or PU coating enhances the aesthetic value of the label. The doming also acts as a protective layer and label becomes tamper and weather proof. Call today for your doming label requirement. 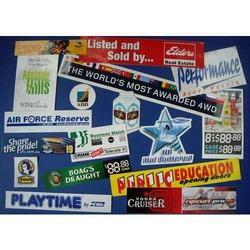 We are engaged in offering wide range of Advertisement Stickers. These stickers are highly appreciated for their smooth finish and durability. These products can be customized as per the requirements of our valuable customers. Looking for Customized Stickers ?